Using a video, a rap performance, a Shakespeare-themed soliloquy and cold facts about industrial pollution, a group of student activists asked the school board on Tuesday to withdraw its contract with Energy Answers, a company that is looking to build an incinerator less than a mile from their South Baltimore school. Free Your Voice, a group organized by United Workers and made up of students from various Baltimore schools and the Curtis Bay area, said the school system should not have supported the planned trash-burning power plant by agreeing to buy power from it. Watford showed a video she and other members of the group had made of their Curtis Bay community featuring points of pride, like the community garden near Benjamin Franklin High School. The video contrasted the garden imagery with images of nearby industry. In December, the students marched from the high school to the former chemical plant where Albany-based Energy Answers has been trying to build the 160-megawatt Fairfield Renewable Energy Power Plant. Opponents have been battling state utility and environmental officials over the estimated $1 billion project for the last four years. Designed to generate power by burning refuse, tires, wood waste, car parts and other material, the plant would, according to Energy Answers, provide 180 jobs and meet or exceed air quality standards. Environmentalists say it would severely harm the health of an area that is already burdened with the highest levels of toxic pollution in the state. The Maryland Department of the Environment (MDE) has said the emissions of particulates, lead and other harmful substances would be within the legal limits. Environmental advocates say the project would not be approved under regulations that have tightened since the plant was approved by the Maryland Public Service Commission in 2010. Baltimore City Schools has agreed to purchase energy from the incinerator through the Baltimore Regional Cooperative Purchasing Committee — a group representing 22 entities in Maryland, including Howard County, Baltimore Museum of Art, the Walters Museum, the city of Annapolis, and Baltimore City. These contracts were signed in 2011, the same year Gov. Martin O’Malley signed into law a bill that designated waste-to-energy incineration as Tier 1 renewable energy. The new standard put incineration in the same category as solar, wind, and other renewable energy. Although the students’ Free Your Voice group has been researching the public health and regulatory issues around the Energy Answers project, Tuesday’s presentation was more about fair community development and environmental justice. After the video concluded, Watford said the Curtis Bay community deserves to be treated as fairly as any other community, that it’s not those who make money from incinerators who suffer health problems because of them. “The only people paying the consequences are the members of the community,” Watford said. Audrey and Leah Rozier, who go by the stage name Double Impact, sang the “Free Your Voice Anthem.” Both girls sang extensively about the harmful effects of air pollution and the values they see behind it. 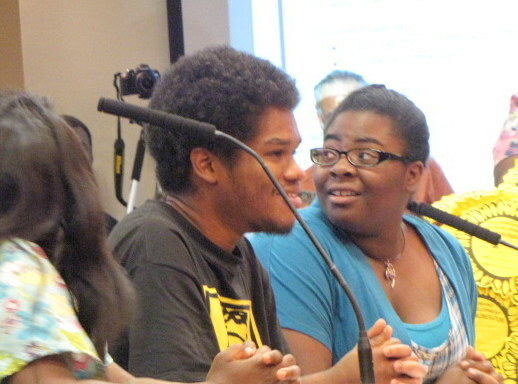 The board members applauded the students’ performance, when they concluded. Commissioner Cheryl Casciani said she would take up the invitation to visit Curtis Bay and that she and other members of the board would examine the purchase contract more carefully. “I’m also on the sustainability commission and we’ve had a chance to hear from a subset of the students as well and we’re definitely in support of what you’re trying to do,” Casciani said. 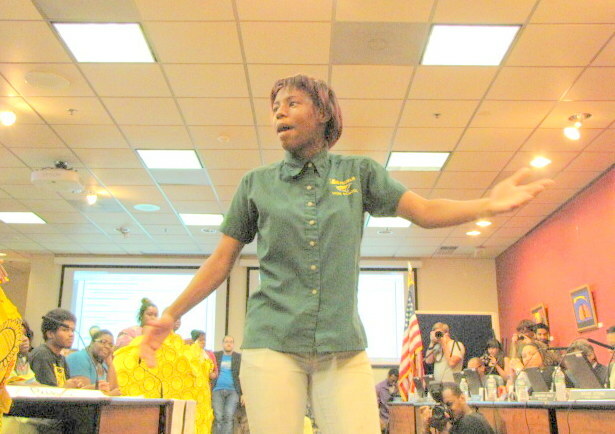 Baltimore high school students stun school board with rap on environmental injustice! from Free Your Voice on Vimeo.